I have been in the butchery business for 30 years. I have been fortunate to accomplish all aspects of the trade. From Pasture to plate. As a young boy going to the live cattle markets with my father. My family home (Pinnock Wood Farm) in Winchcombe, being a live stock farm, stocking cattle, pigs and lambs, plus my school farm, Bredon School,inBushley, Tewksbury also stocked cattle, pigs and lambs also chickens and ducks which was situated on the school grounds. So I have been surrounded by live stock most of my childhood. My father also had been a butcher, plus my 5 uncles were too, and one of my grandfathers was a head chef in the navy in world war 2. My father, having his own business from the late 60s right through the 70s and 80s, with achieving of 54 retail Butcher shops, 40 fruit and vegetable retail shops, plus 1 fresh meat Wholesaler and 1 dry goods sundries wholesalers. I have been very lucky to have been involved within the meat trade all my life. From 1987, I started having work experience in one of my fathers butcher shops plus having the experience being involved in the wholesale side too. Helping loading and unloading the lorries, to vac packing, going through all the offals, too pallet wrapping and so on. All this experience of growing up as a youngster and being involved with in the meat industry was in my school holidays, my father took me everywhere in his working day, to give me and show me how exciting this trade is. Not only my father was giving me his wealth of experience and knowledge of the business, but he was also character building me. When I left school which was on a Friday, I was in work on the Monday with my father, straight in 75 hours a week, and from that first week, I’ve never looked back since. In 1985-1988 I shown lambs and cattle at the three county show in Malvern, representing Bredon School of Tewksbury. To working in different supermarkets butchery departments. Also working on sheep farms, cattle farms to, fresh meat wholesale which were combined with the Duke Of Edinburgh award scheme Bronze Level. From 1988-1993 I was a trainee butcher. Having a hard, but effective butchery training,it has giving me the foundation of self discipline, motivation, drive, determination, self confidence, loyalty, and the hunger to become the best Butcher I can be.My butchery education included skills of, knife Sharpening Skills, De-Boning Skills, Displaying Skills, Tying Skills, Manufacturing Skills, to Book keeping, Sign Writing, Marketing Strategy, Marketing Communication, Customer Service Management, Customer Experience, Customer Behaviour, Team Leadership, Management, Time Management, Teaching, Training, and Master Class. When I accomplished to becoming a professional butcher, I made sure I pushed myself, and gained as much knowledge and experience as I could in the business. I managed to get a job with a family run business with 23 shops. And there I started as a butcher, butcher salesman, to head butcher and then to relief butcher ( holiday cover ) that was my chance to work my way up to area supervisor. Covering Cheltenham, Tewksbury, Swindon, Oxford, Bristol, Bath, Wales, Forest of Dean, and Weston-super-Mare. Which in time successfully, I achieved. In this part of the meat industry is where I learned fitness, stamina, and discipline. Portion control to mass volumes of the same product. Also a big education on the knowing and understanding on each and every muscle, and where the seams are, and grows. Which helped me to develop with more confidence in my career. I decided to start my own business in 1996 - 1998 in the concessionaire butchery department in Gloucester. 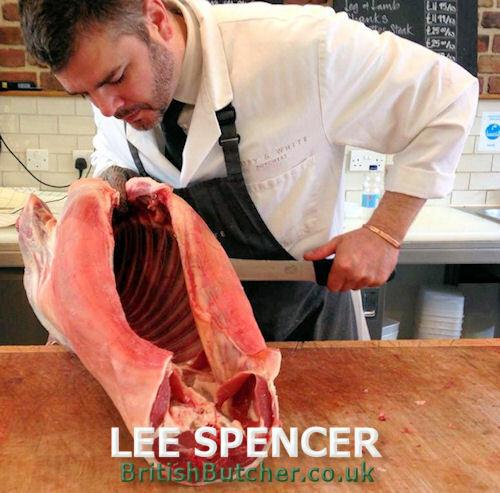 Lee's Family Butchers. A really good opportunity to start a butchery business on, not having a lot of money. I supplied a number of restaurants, pubs and cafés. Within the 2 years of trading experience, I learned a lot about myself, pressure levels, self discipline, money management, priority decision making, banks, cash flow ect. All about running a business. Unfortunately the Kwicksave save super market went into liquidation and my store was one of the first to close down. This business was one of my greatest gamble. A full continental delicatessen, with my wife by my side. We sold cooked meats from all over Europe and of corse traditional English cooked meats. To co inside the business, we had a 7 day a week carvery. A choice of 4 meats and seasonal vegetables. We made home made meat pies, pork pies, pasties, to pizzas, Italian dishes, Spanish dishes polish dishes on a daily basis. I also opened up my butchery and pastry school, which was becoming a big success in the business. We only had a temporary short lease of one year, then optional to a 5 year lease. As a family decision we decided to close. Within the 30 years, I have been in management for 14 of them. From 1996 to 2017, also having achieved, opening 2 businesses, I have been fortunate to manage fantastic establishments and worked with amazing butchers, which have all given me knowledge, experience, and advice along the way. The meat trade for me, is a very exciting and passionate business to be in. And I emphasise, every day is a school day. With all the wealth of my knowledge and experience, I still work to my utmost full potential. Giving my all, on producing breath taking front shop displays, back show displays, to multi - decks and up right fridge displays. Meat perpetration to the finest details, manufacturing verity of sausages and burgers, faggots to, dry cure bacon, home cure bacon, sweet cure bacon, maple cure bacon, collar bacon, gammons joints and steaks. And most of all, I'm still learning.